October 4, 2016 (Springdale, Ark.) – INOV8 Music Group artist Meredith Kinleigh, who has spent much of 2016 touring with the likes of Grammy Award-winning vocalist Jason Crabb and platinum-selling band Kutless, announces today’s release of a new single. The song, titled “Living Sacrifice,” was written by award-winning songwriters Mike and Deanna Geier. “Living Sacrifice” is being serviced to Christian INSPO and Christian AC-formatted radio stations and is available on iTunes, Google Play and all digital outlets. “Living Sacrifice,” produced by Sean Hill at Uphill Recording Studios,” follows the success of “Sail On,” the first single released from Kinleigh’s debut EP, “Beautiful Mess,” and “Beautiful Mess,” the title track. “Sail On” aired on more than 1,500 radio outlets worldwide and was the No. 2 song of 2015 on the Christian Radio Chart (CRC). Mike and Deanna Geier, who penned “Living Sacrifice,” are a husband and wife duo who began their music careers more than 15 years ago in Hollywood, California. The couple works out of The Hidden Studio and have a placement studio named Velvet Rope Records. The songwriters have written and produced songs for independent and major label artists, as well as writing theme and background music for shows appearing on NBC, The CW, ABC, NICK, MTV and VH1. Their music also has been featured on national movie trailers and commercials. The Geiers were named Songwriters of the Year for the 12th Annual ChristianSongwriting.com international competition hosted by CM United. Kinleigh has spent much of the year touring. This past February and March, Kinleigh toured throughout the Southeast and South with Crabb and singer Natasha Owens. She followed up those dates with a 17-date North American tour with Kutless, Christian rock band 7eventh Time Down and Owens. One year ago, to celebrate the release of her debut EP, Kinleigh performed a duet with Dove Award winning vocalist Mark Schultz at two of the chapel services at The Chapel, Green Campus in Uniontown, Ohio. Kinleigh, who has been involved with music ministry since she was young, currently leads worship each week at her father’s church. Her music career has included singing the National Anthem at minor league baseball games, co-directing and acting in local theatrical productions and singing as a soloist for weddings and other events. Kinleigh signed with McLaughlin Music Group for development and management in May 2014 and signed her record deal with INOV8 Music Group in July 2015. 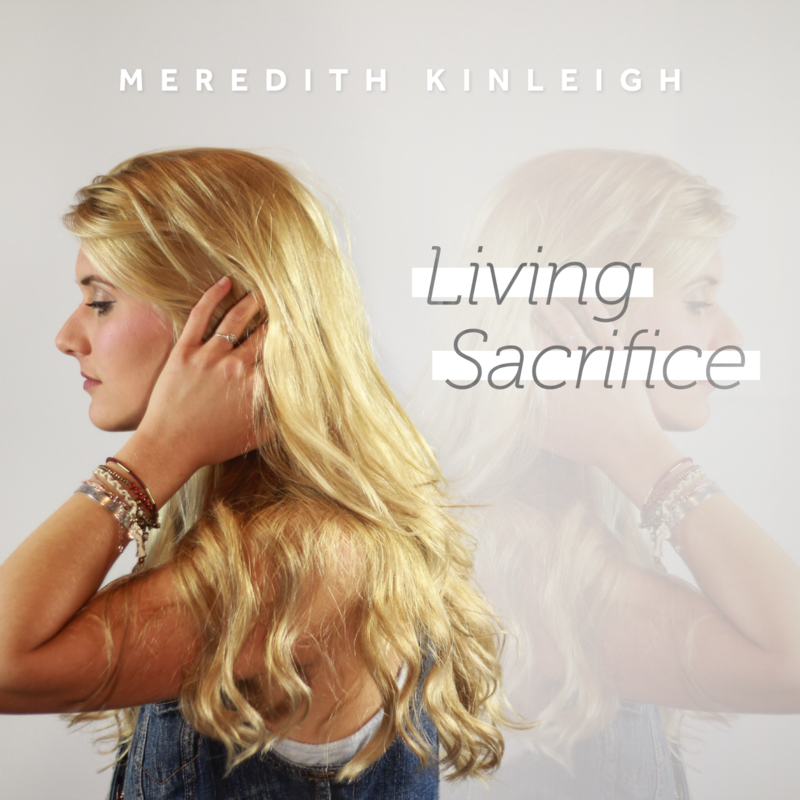 To learn more about Kinleigh and “Living Sacrifice,” visit meredithkinleigh.com, like Kinleigh on Facebook and follow her on Twitter. For more information about Mike and Deanna Geier, visit thehiddenstudio.com.